A couple of numbers come to mind in astronomy that are part of the fields general knowledge. One such number is the Moon’s distance to the Earth. If you were to venture a guess of 384,00 km (238,600 miles), you’d be pretty close. This number, however, is only the median distance of the Moon. Since Johannes Kepler (1571-1630), we have known that celestial bodies don’t move in a circle, but rather in an ellipse. With this logic, the Moon’s distance to the Earth varies. Especially impressive is when a full Moon occurs at its closest or furthest point to Earth. 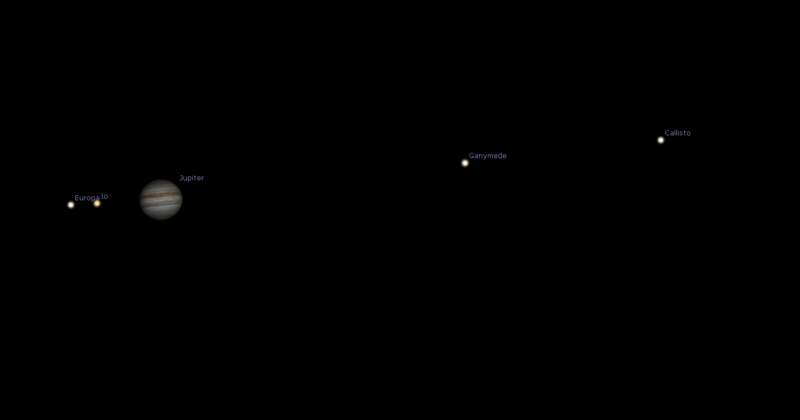 The images show the difference, as simulated by Stellarium planetarium software. To the left, we can see the full Moon in the night from Friday to Saturday. The picture to the right shows the full Moon on the 14th of November, later this year. At this time, a full Moon will occur at its closest point to Earth. In raw numbers: currently, the moon is just over 407,000 km (253,000 miles) away, while in November that number would stand at 357,000 km (222,000 miles). Side note: the nearest point of an elliptical orbit is called the Perigee, and the furthest Apogee. Currently, the moon is nearing the Apogee. For solar eclipse observation, the Moon’s distance, whether in Apogee or Perigee, plays an important role in the observation experience. If the Moon is close to the Earth, it won’t totally obscure the sun, resulting in a ring-shaped eclipse. 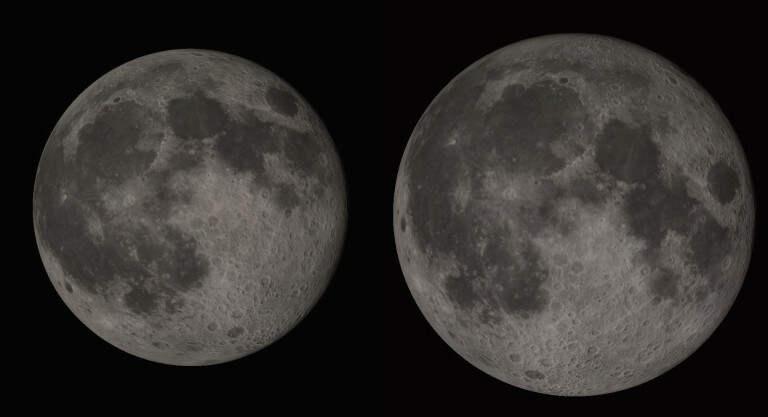 With the naked eye, the difference between the especially small or large full Moon is not immediately obvious. If you are a regular Moon observer with the same scope or camera, the difference in size will be more apparent. The Moon isn’t especially high in the sky this time of year, so it will long remain just above the horizon. As often with the Moon and its proximity to the horizon, there is a phenomenon of optical trickery, in which the Moon appears much large when closer to the horizon, as compared to when it is high in the sky. The fact that this phenomenon is not the result of an astronomical effect, rather of cognition, is easy to prove if you photograph the Moon. As it rises slowly behind a mountain, the Moon with its light shining through a mountainous forest, appears enormous. Photographing the moon at this point leads to some disappointment. You can further escape this illusion by using your thumb to cover the Moon, which works just as well during the moonrise as in the middle of the night, with the Moon high in the sky. This trick helps you see that Moon size hasn’t changed at all. For more information on the Moon and this optical illusion can be found on Wikipedia at Moon Illusion. 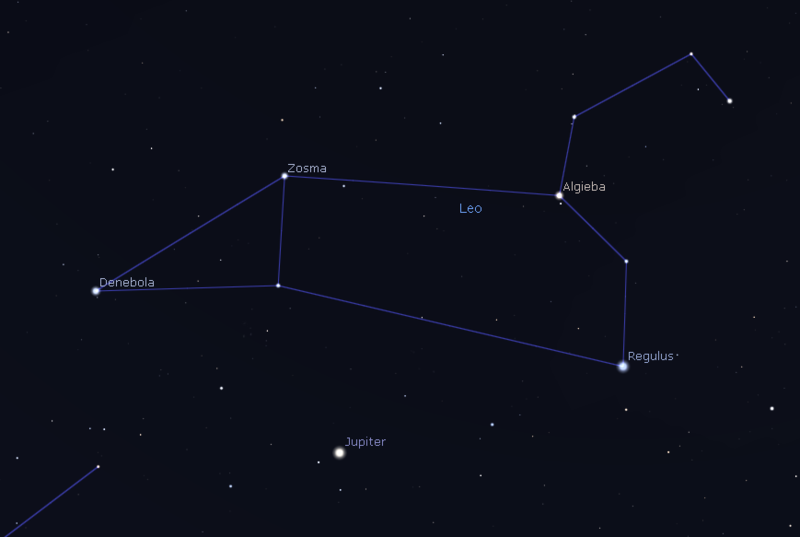 Completely undisturbed by the Moon currently is Jupiter, found in the Constellation Leo high in the night sky. Jupiter is, as always, a rewarding object for any scope. Even with binoculars, you can recognize the planet and four of its large moons, as seen in a line left and right of the gas giant. These moons are especially large. Callisto, the furthest of the four, is almost as large as the planet Mercury. In the following nights we will be able to observe, how Callisto will retreat from Juptier and appear almost as its own star. On Sunday, it will then turn back towards the gas giant. Close to Jupiter are the moons Io and Europa, which move slowly around the planet. Io is the closest of the four moons and as a result the fastest, approaching Jupiter’s disk in the second half of the night of Friday to Saturday and transiting across the planet. Europa will follow in the early morning hours. A special note: there will be a great opportunity to see Mercury in the night sky. The best time WAS between the 10th and 19th of April. However, on the 25th of April another chance at a glimpse of the planet! Good luck!